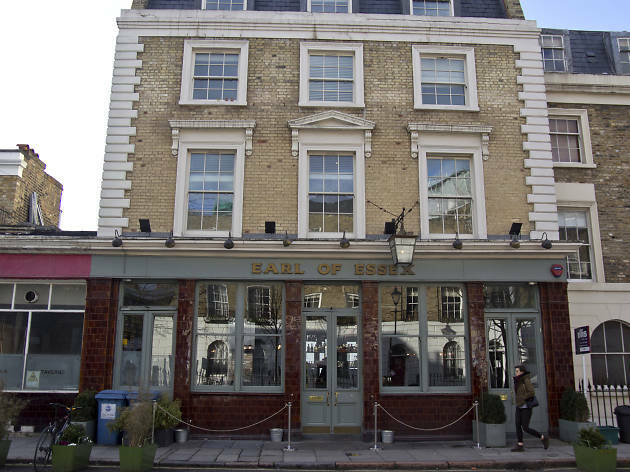 March 2019: Many of the best pubs in London remain the oldies. But new at number 32 is the Duke of Hamilton, a Hampstead pub under new management that the neighbourhood seems to have taken to – particularly of a Sunday lunch time. And riding high in our countdown is the Compton Arms at number six, a pub from the team behind Homerton’s The Gun that has a proper pub atmosphere, interesting beers and a sausage roll to rival that of The Ginger Pig. 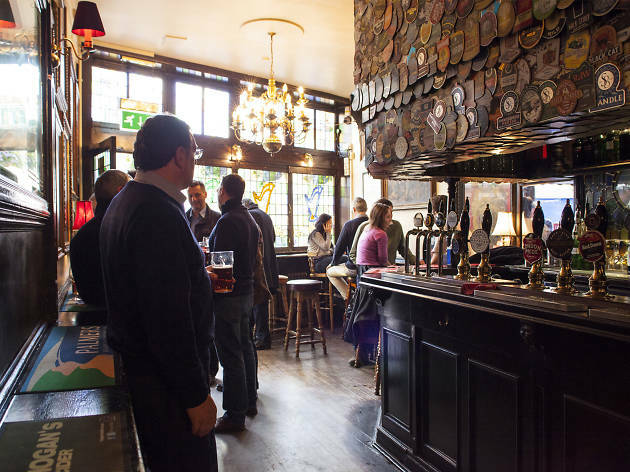 Searching for the best pubs in London? You’re in the right place. The capital’s drinking scene is one of the best in the world, where you can bounce from historic and traditional pubs to modern boozers pulling perfect pints of craft beer. 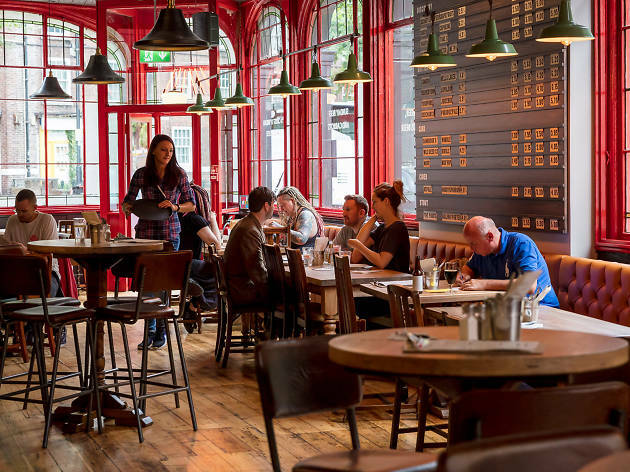 Whether you’re looking for a cosy place with a quiet corner, you’re interested in buzzing spots for a group session on the ales, or you’re after family times complete with the finest Sunday lunch, these London pubs cater to all appetites. 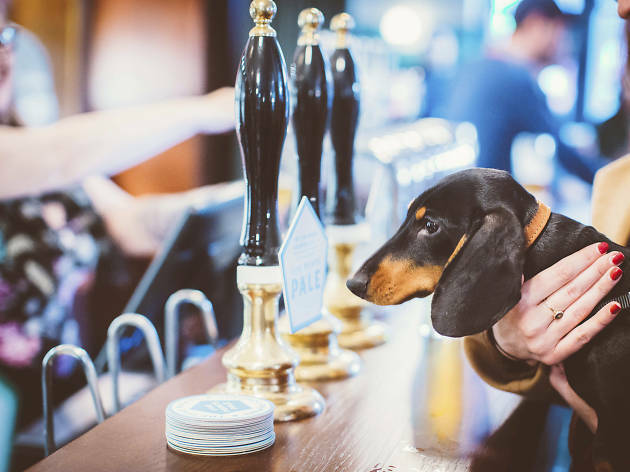 We’ve rounded up our favourite pubs across the capital, so you can cut out the faff and concentrate on getting a round in. Bottoms up! 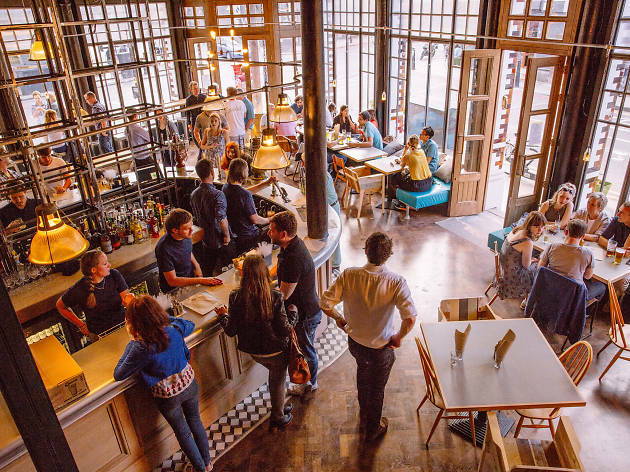 Find out more about how Time Out makes recommendations and reviews bars here. When to visit: Weekend afternoons are laid-back, lively, and awash with local love. What’s the vibe? You’ll know this London landmark by the cluster of punters gathered on the pavement outside. But you should also know it for regulars the like of Charles de Gaulle and Francis Bacon; this is Soho history. Always crowded, insanely atmospheric, pavement spillage inevitable. When to visit: For a whole rowdy, boozy night, if you can squeeze in. Un verre de reserve du patron, s’il vous plaît. What’s the vibe? Stepping into this backstreet Hackney boozer is like stepping into a countryside inn. The community saved The Chesham from re-development, so feel the local pride shine through. When to visit: Do it country-style and settle in by the fire with the papers on a cold afternoon. What to drink: Camra voted this their favourite new pub, so get stuck into the ales on rotation. What’s the vibe? Of all the riverside pubs, this one is the most special. Really really old, really really near the river, really really good. Soak up the atmosphere in a dark, wooden alcove or arrive early for a space on the decked terrace – you’ll have the Thames lapping underneath you when the tide comes in. When to visit: On a walk along the interesting bit of the Thames path – when the river is wide, dark and ex-industrial. 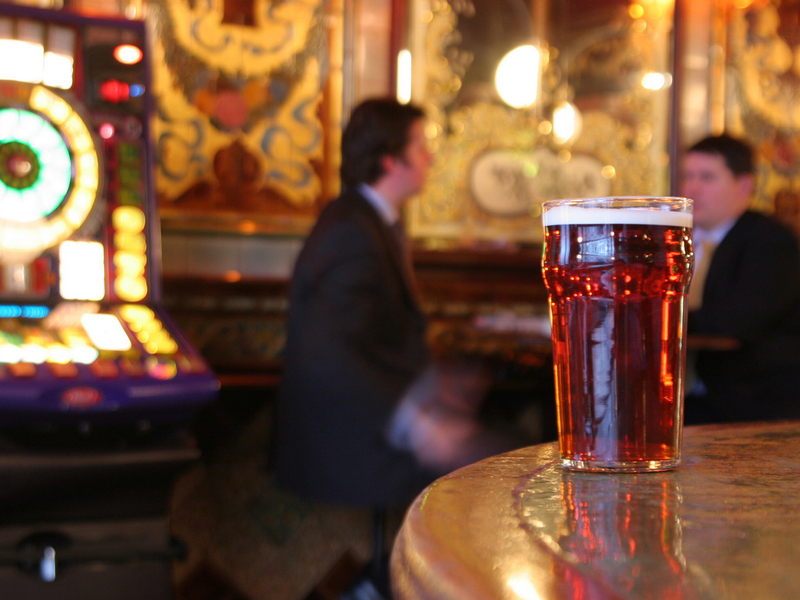 What to drink: A pint of something brown, English and comforting. What’s the vibe? One of London’s pub treasures. Saved from developers by the local community, you can feel the positivity – from daytime mother-and-baby classes, to evening chess club right through to live music acts on its stunning stage. When to visit: When you need reminding that London isn’t always just a sprawl. 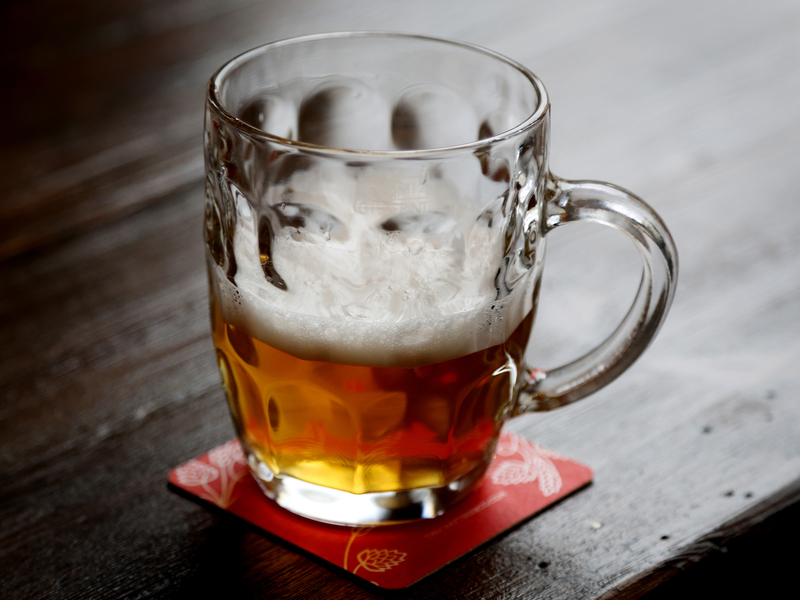 What to drink: A glass of vino or pint of ale you feel like making last. What’s the vibe? 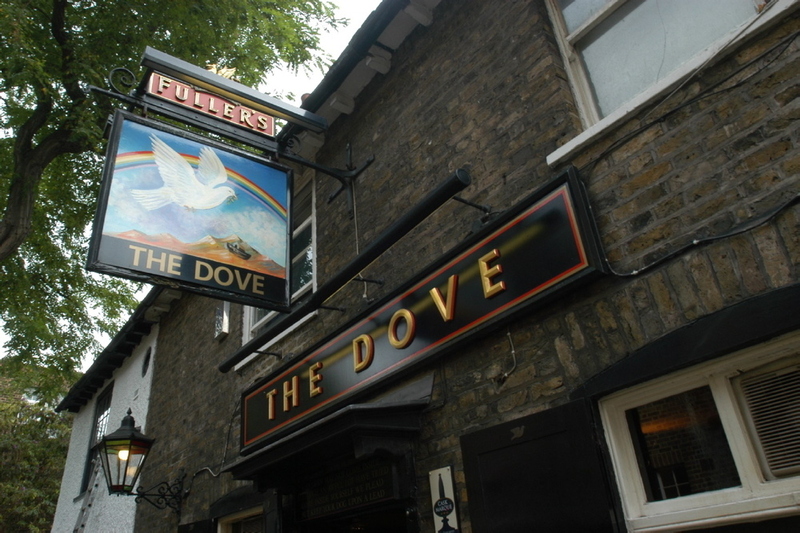 Orwell’s favourite pub gets a sensitive revamp. It’s now a haven for pub purists. When to visit: When your tummy is rumbling – bar snacks and larger plates seriously impress, including a sausage roll to write home about. And we’ve been eyeing up their Yorkshire puddings on Instagram, too. Keep it old school with Sambrook’s Wandle or sample one of the house negronis. What’s the vibe? This ale house keeps it real and is a much-treasured asset for the locals who saved it. 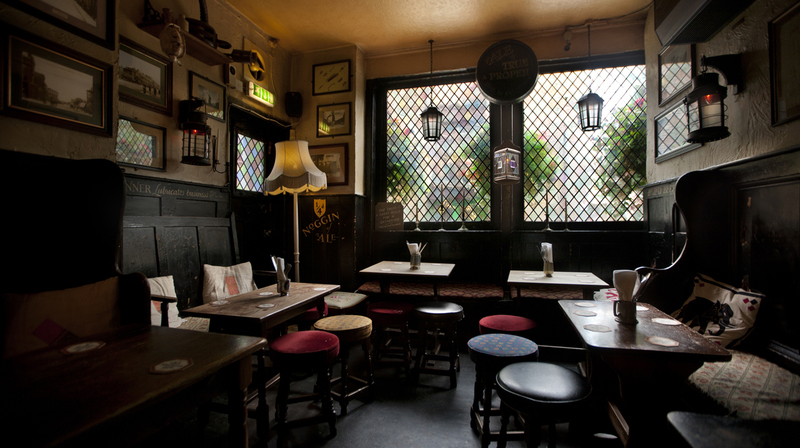 Visit and remind yourself that in a city full of institutions, the London pub is perhaps the best one we’ve got. When to visit: You probably won’t be passing, ever, so make a night of it and bring all your pals. What to drink: There’s often a mild pouring, which you don’t often see these days. What’s the vibe? Nowadays, almost every new pub tries to sell itself on a ‘craft beer’ offer, but not all manage it on this scale. 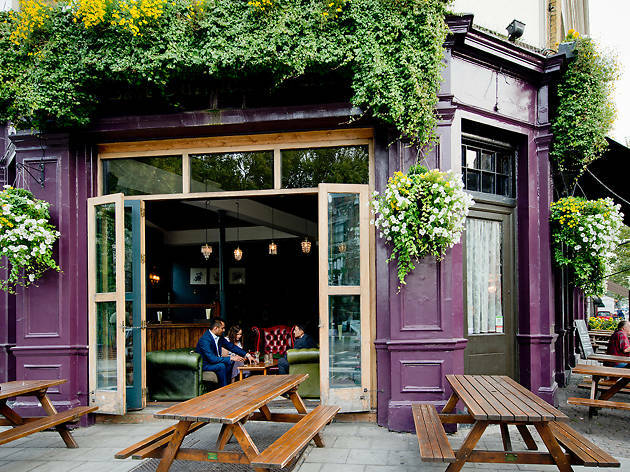 That’s why this backstreet pub packs them in; the Earl of Essex is a lovely local, beer-focused but welcoming to all and with a cracking garden out back. 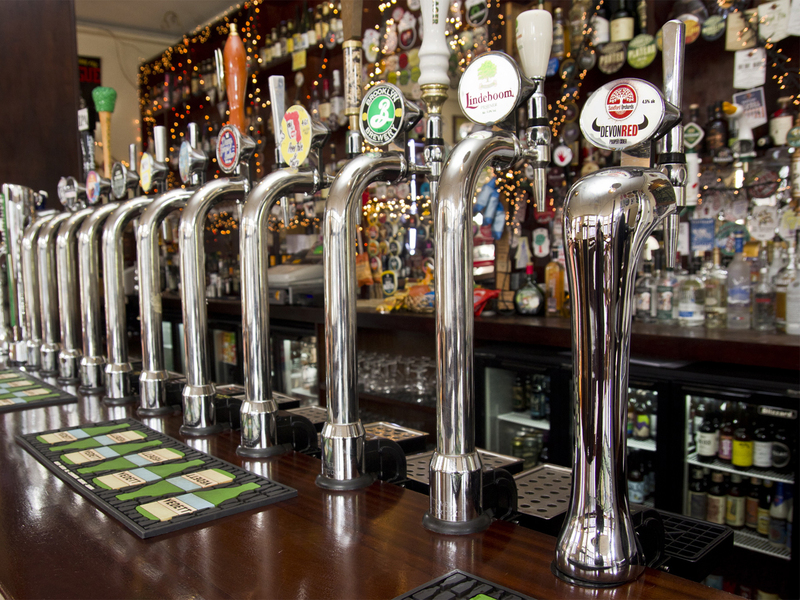 When to visit: For a beery but refined evening – everything on tap is great. What to drink: Ask what’s on from Earl’s brewery. What’s the vibe? 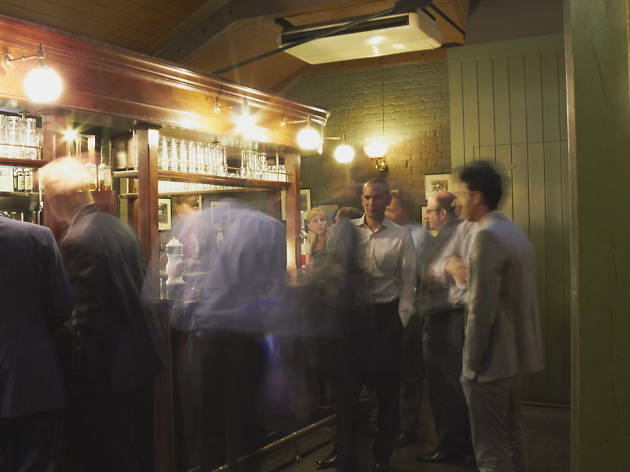 You can feel the history in the weathered wood of the joyously unmodernised main bar. All of K-Town mingles here, so it’s a constantly lively scene. The Pineapple gets crazy as a coconut on first-rate comedy nights. What to drink: A pint of Camden Hells lager, the local brew. What’s the vibe? A traditional, petite backstreet pub that’s effortlessly keeping up with twenty-first-century drinkers. Laidback sessions reign at The Queen’s, except on Thursdays when trad jazz kicks off around the old joanna. 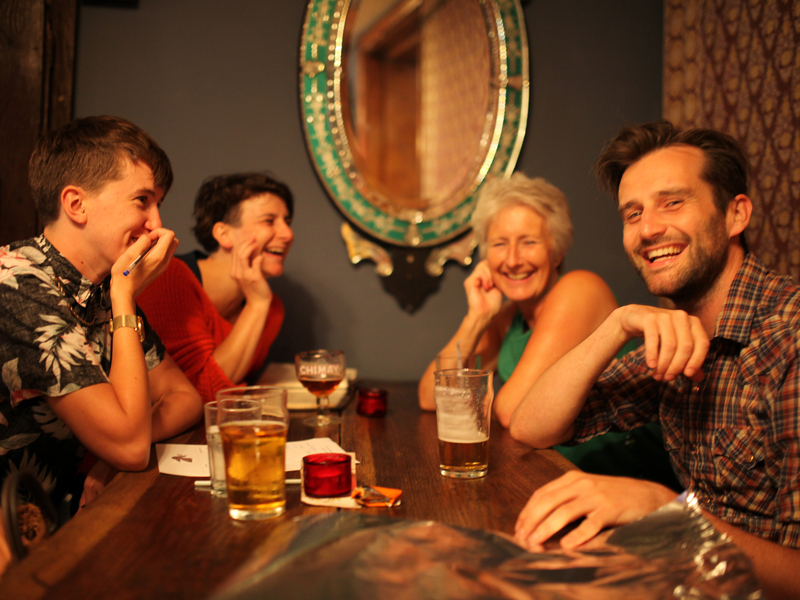 When to visit: When meeting friends from the north straight off the train. It’s a great advert for the London pub. What to drink: One of the stronger bottled porters – perfect with a handmade pork pie or cheese plate. What’s the vibe? Many dub the Shillelagh the most authentic Irish boozer in the Big Smoke, and we’re yet to find evidence to suggest otherwise. When to visit: When it’s a rugby match day. Post-game celebrations can get pretty lively, especially when Irish eyes are smiling. What to drink: Guinness. End of. What’s the vibe? 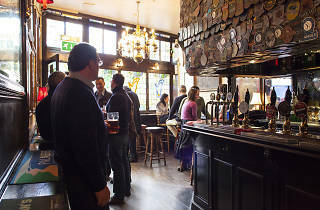 A glamorous ex-hotel turned vast local boozer with stunning architecture and plenty of elbow room for a peaceful pint. You could quite easily monopolise an area of this vast pub for a large gathering with pals or equally find yourself a quiet corner – it’s massive. When to visit: When you want to keep yourself to yourself. 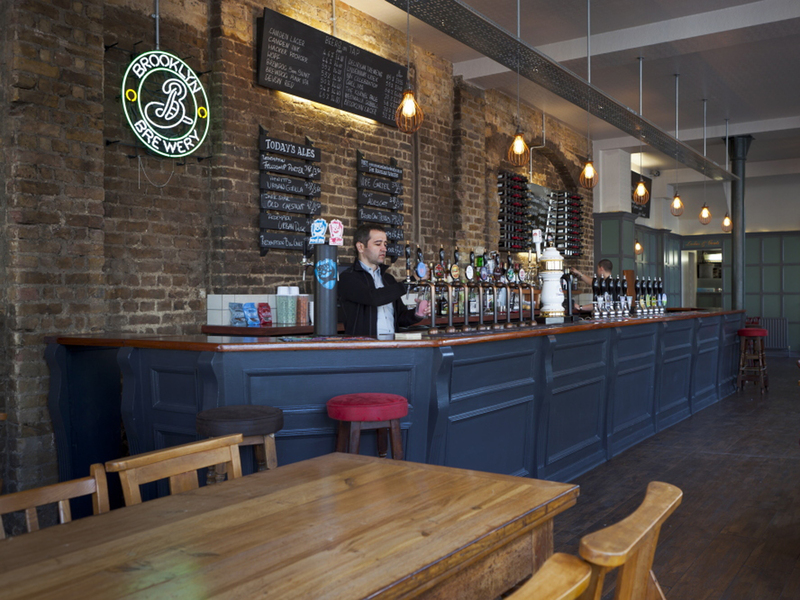 What to drink: London breweries such as Acton’s Dragonfly are well-represented; sip at something with zero air miles. What’s the vibe? Try before you buy. 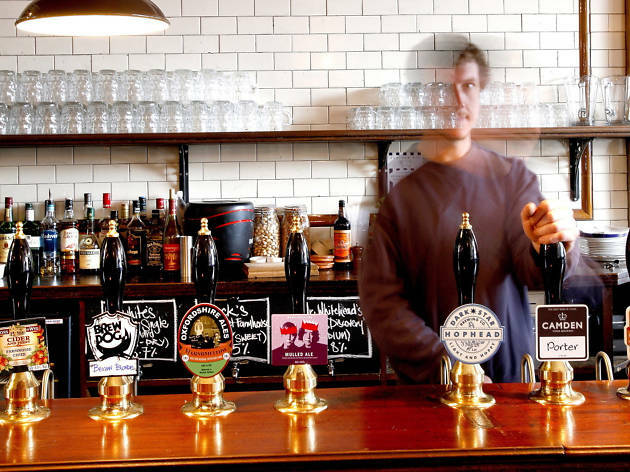 This Nunhead beer seller has a bar at the back for those keen to sample its London-leaning selection on cask or keg. 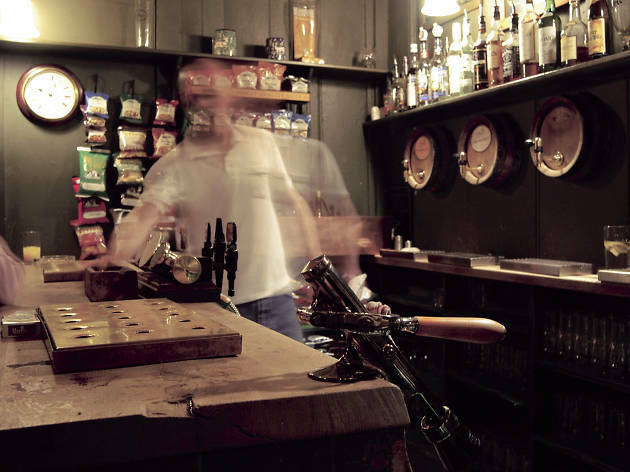 Staff are so approachable that many who drop in for a takeaway bottle end up staying for several pints. When to visit: Attend a meet-the-brewer session for a full lesson on the humble hop. What to drink: Let the couple behind this top operation guide you – advice doesn’t come friendlier than it does here. What’s the vibe? 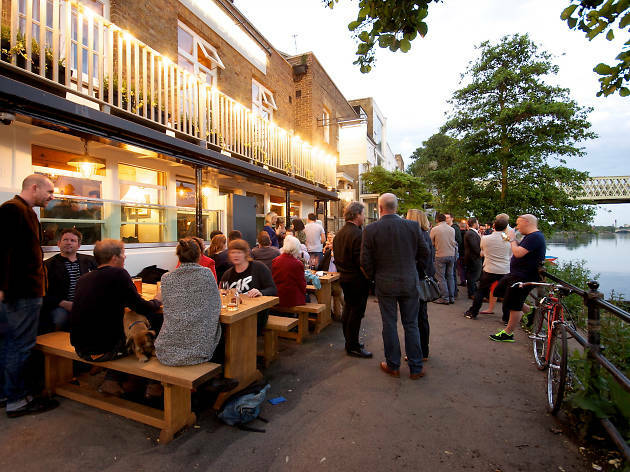 Lively, undiscerning, fun-loving crowds flock to the Fullback for fun times in north London’s best beer garden. 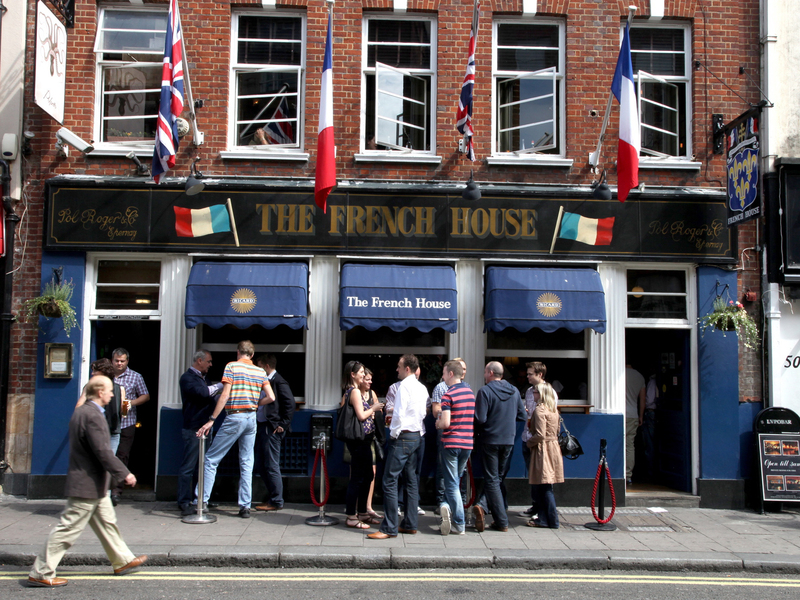 All major sports are screened to lively crowds, but this is a rugby fan’s pub above all else. When to visit: On a summer evening that you want to extend as far as possible. What to drink: Guinness. None of it's fancy, so you might as well embrace the classics. What’s the vibe? A cosy and unassuming little boozer bringing a touch of flamenco to Fitzrovia. Don’t let the name mislead you – tattered furniture and jukebox tunes make Bradley’s as ‘pub’ as it gets. Londoners love the low-key vibe. When to visit: When another rainy day reminds you that you’re definitely not in Spain. What to drink: A glass of Spanish wine – it offers the most Bamboléo for your buck. What’s the vibe? Stokey local with a cosy atmosphere, a captivating food menu and a welcoming vibe. When to visit: It’s perfect for the weekend – start with lazy afternoon grazing and then move onto G&Ts on the smoking deck. What to drink: Take your pick from 22 craft beers as well as negronis on tap. What’s the vibe? 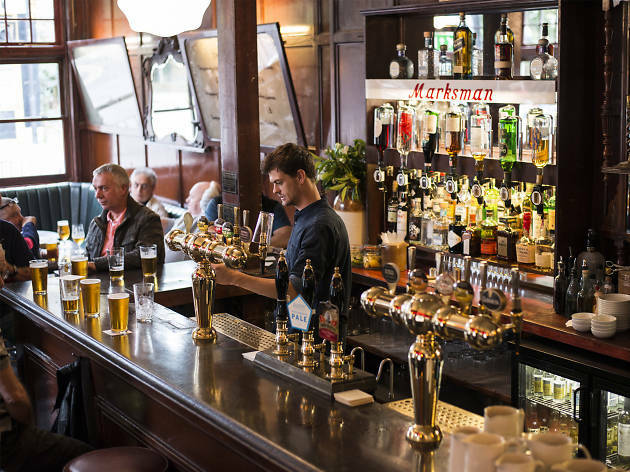 This reliable Victorian pub in the West End pours craft beer from 18 taps in total. Its pokey and old-timey interior is a million miles from the bright lights and selfie sticks of Piccadilly Circus. As such it ushers in clued-up solo drinkers and groups willing to share a table (it really is small in here). When to visit: When you need to escape tourist hell, where better than a comforting temple to beer? What to drink: Opt for something unusual, like Magic Rock’s High Wire Grapefruit. What’s the vibe? A no-frills Mile End pub that’s authentic to the end, The Palm Tree provides a Cockney experience more intense than Danny Dyer pulling pints at the Queen Vic. The middle-of-nowhere canalside building may look abandoned from the outside but venture indoors for a deep, dark red boozer with heaps of character (and characters!). 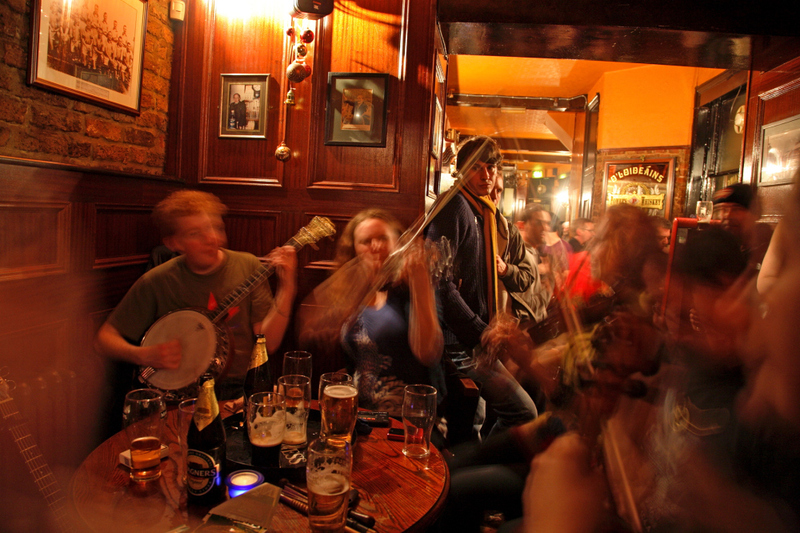 When to visit: Come on a Saturday night for an unpolished East End singalong. What to drink: Who cares? It’s all about the atmosphere. What's the vibe? A former school for girls is now offering an education in beer. When to visit: The pub caters to all seasons, but it's during football season when it comes alive. What to drink: There are 20 ‘house’, ‘craft’ and ‘cask’ beers. Although you'll find none of that craft beer snobbery here. What’s the vibe? An out-of-the-way old man pub that’s young at heart. 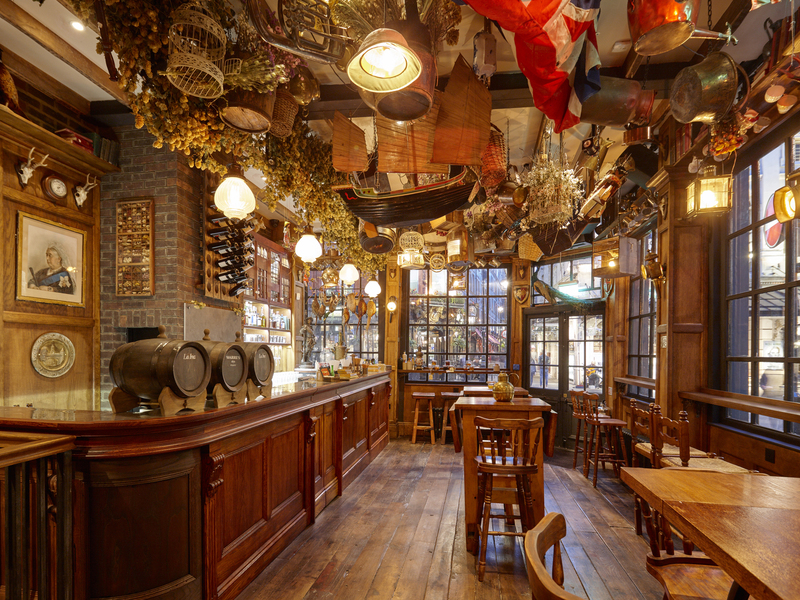 If you asked your granddad to design a pub this is probably exactly what he’d come up with (in the best possible way). When to visit: To settle in for a long afternoon session. 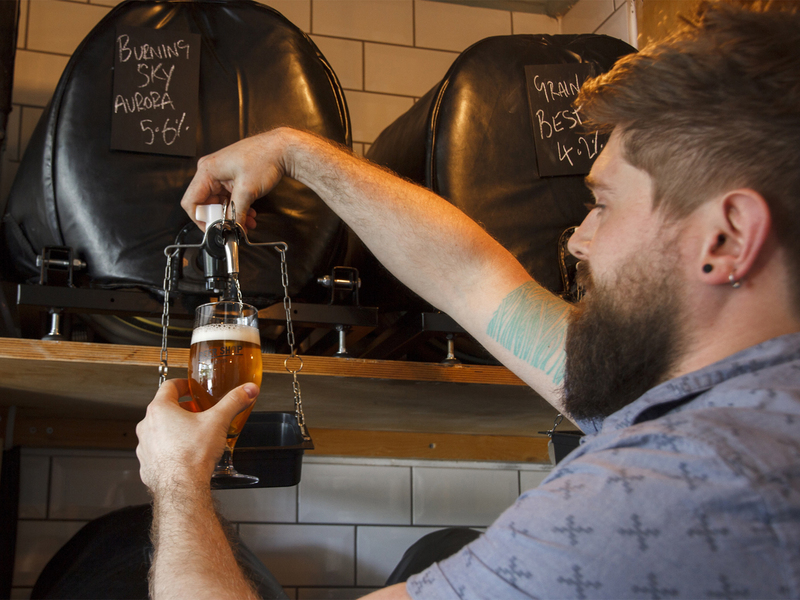 What to drink: Pick from the casks – they’re well-chosen and all under £4 a pint. What’s the vibe? 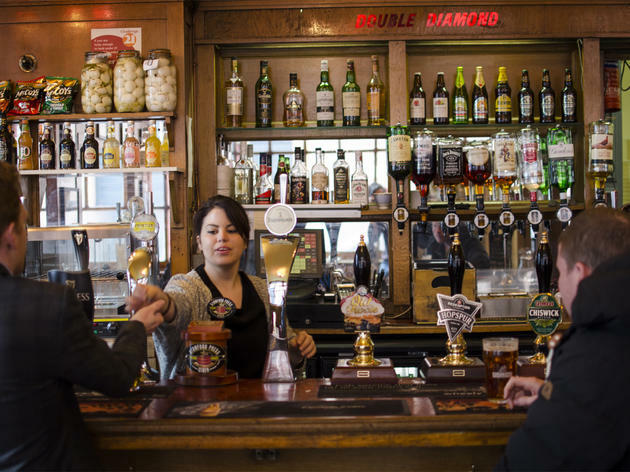 Award-winning boozer that’s all about the ales. Prices are blissfully low, making it a rare find for Covent Garden ale-ficionados – beer mats plastered to the walls are testament to this. 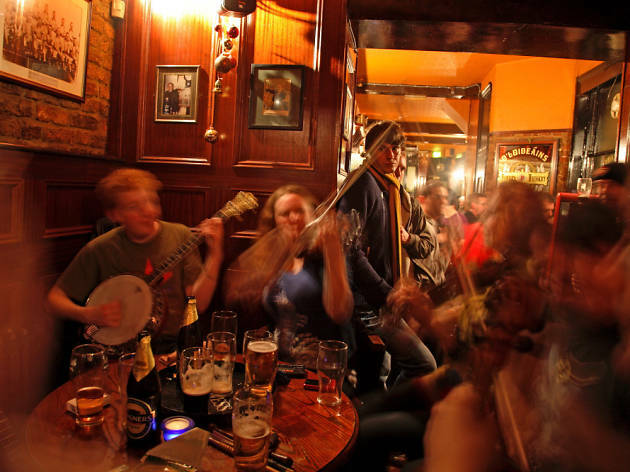 The Harp is also cherished by an artistic audience, with many of the stars of nearby opera houses partaking in post-show pints. When to visit: When you’re in central London and crave a quality ale. What’s the vibe? A temple for Belgian beer enthusiasts on the buzzing Broadway Market stretch. This little birdy is decked out in dark wood and has large communal tables for those seeking a truly continental experience. When to visit: Soak up the buzzing beer-hall vibe by visiting after a Saturday trip to the market. 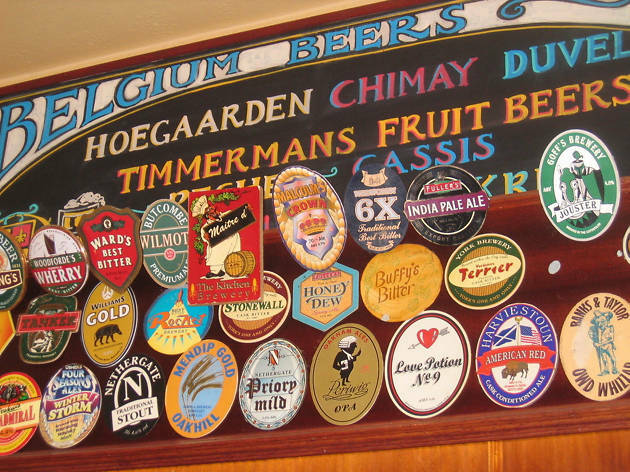 What to drink: Any of the Trappists by the bottle, or a pint of draught De Koninck. What’s the vibe? 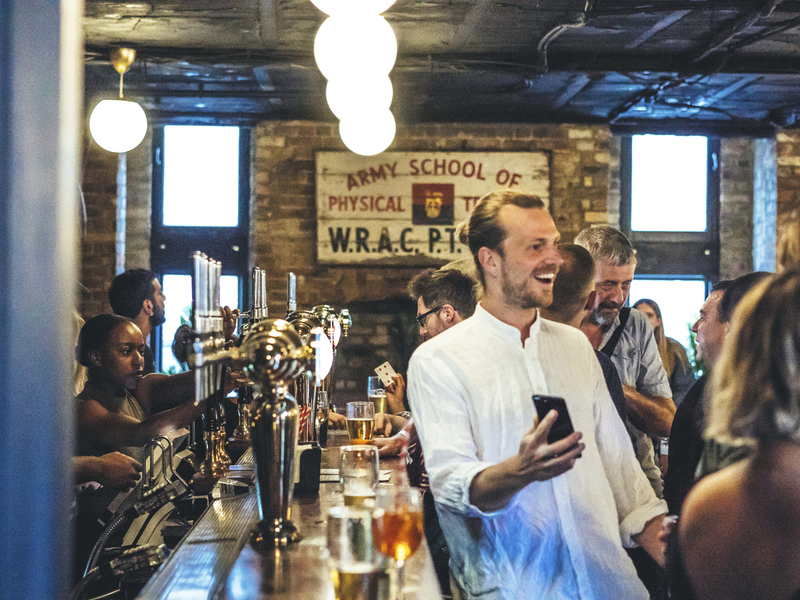 The kind of pub you dream of stumbling across, this ancient-looking brewery-owned boozer is one of the most authentic pubs in the city. Surprising, then, that it’s only been going since 1990. When to visit: When the loyal regulars from the surrounding ad agencies are stuck in pitch meetings. You may be lucky enough to bag a seat by the fire. What to drink: The comfortingly sweet St Peter’s Cream Stout is the ideal introduction for anyone cautious of darker brews. What’s the vibe? 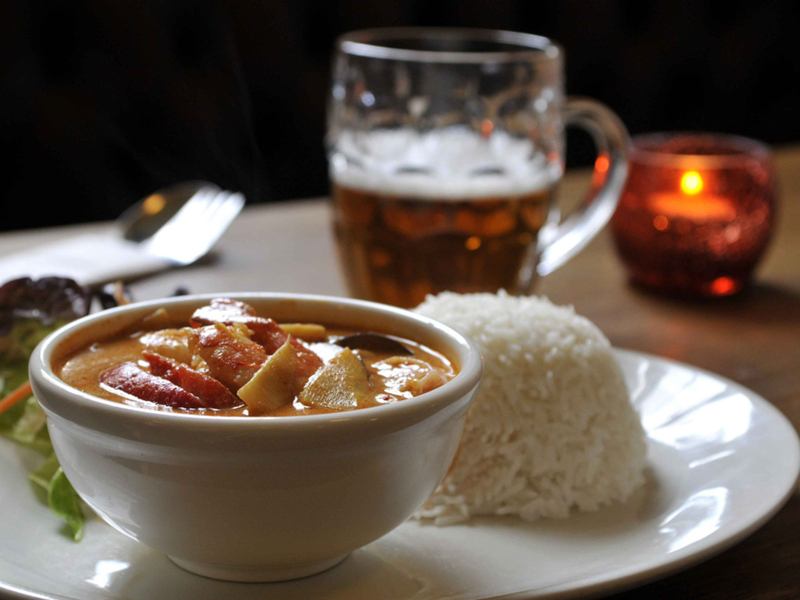 Looking for the best pub grub of your life? The Marksman is famed for its superlative plates in a classic setting. When to visit: Book ahead for a dinner date and stop by before for an aperitif at the bar. What to drink: Seasonal ales that still keep old regulars coming through the doors. What’s the vibe? 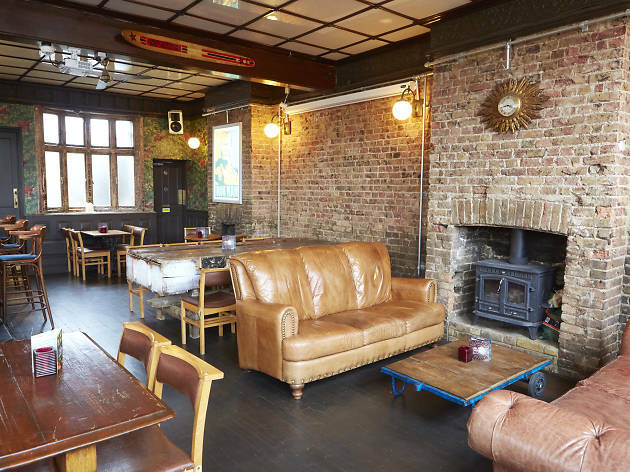 Beer-focused Deptford boozer with bare-brick walls, snug sofas, a pinball machine and a large horseshoe bar. The pub’s pizzas are as well regarded as what’s on tap. When to visit: When you fancy catching the beautiful game. Grab a spot in front of a big screen and order in those pizzas and pints. 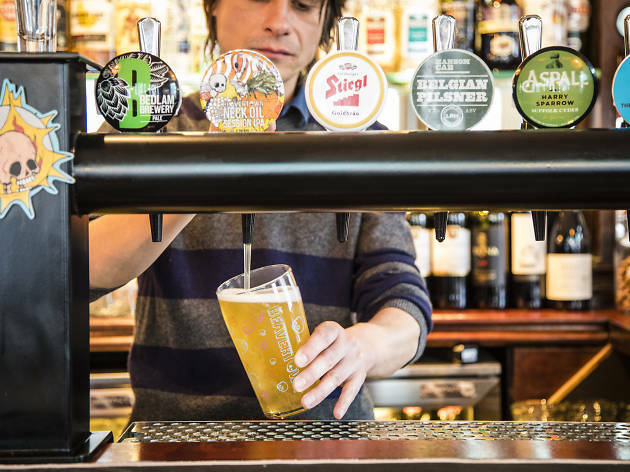 What to drink: On tap you may find the likes of Frontier, Vedett and Whitstable Bay, plus a selection of ales for the purists. What’s the vibe? 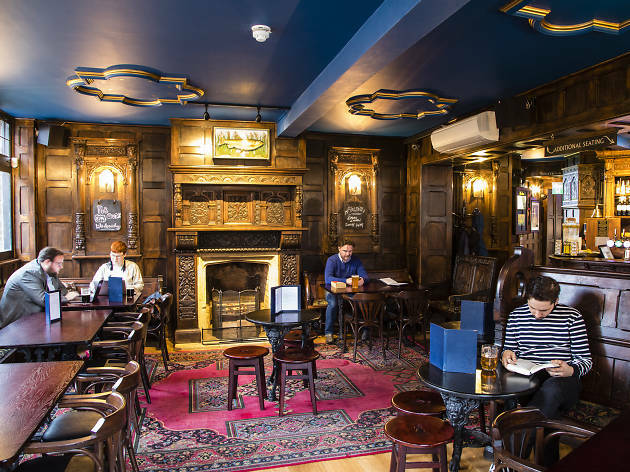 This long-standing Soho spot is old-school and unpretentious, with a wistful pride in its heritage as a writers’ drinking den. Throwbacks include the threadbare carpet and jars of pickled eggs, which are flogged at the bar. 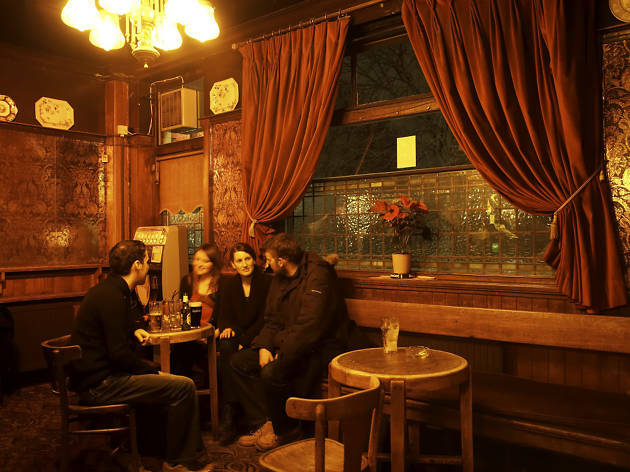 When to visit: On a Wednesday or Saturday night for the bi-weekly piano singalong, which sees cockney classics and pop hits alike belted out with boozy abandon. What to drink: The standard Fuller’s ales are nothing special, so go for the guests: Redemption’s punchy Hopspur makes regular appearances. What’s the vibe? 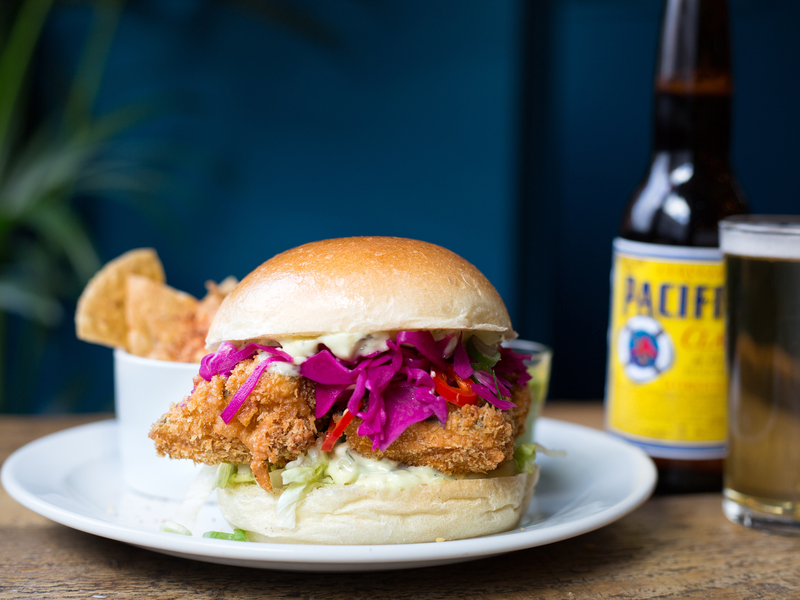 London’s first fully fledged vegan pub from the team behind ground-breaking street food operation Club Mexicana. When to visit: When you fancy guilt-free indulgence. Just make sure you book ahead, as this world-saving grub is in serious demand. Pub quizzes are popular, too. What to drink: All drinks are purely plant-based, from beer on 14 taps to sour cocktails made using chickpea water. What’s the vibe? Camra-championed local boozer serving down-to-earth pints in well-heeled Putney. 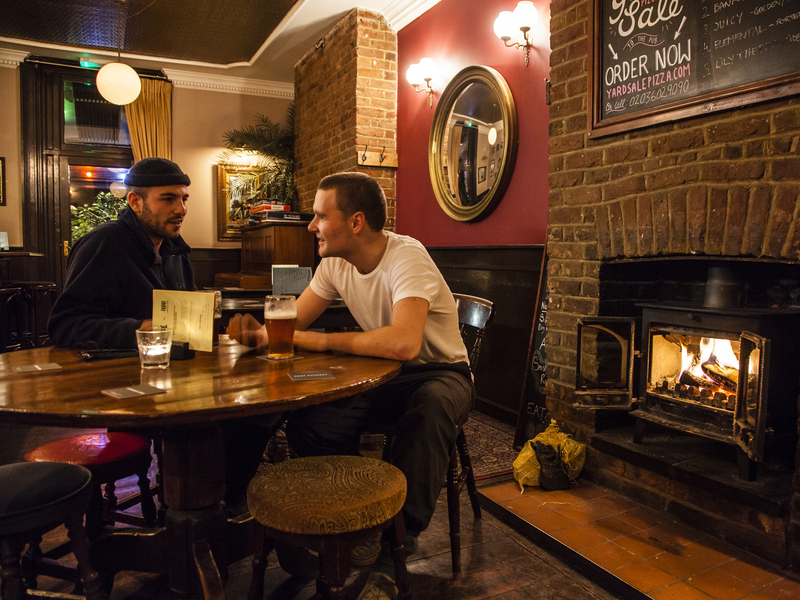 This is what people call a ‘proper pub’ with a beer garden, bar skittles and a roaring fire. When to visit: A winter’s eve – bagsy a seat by that fire. 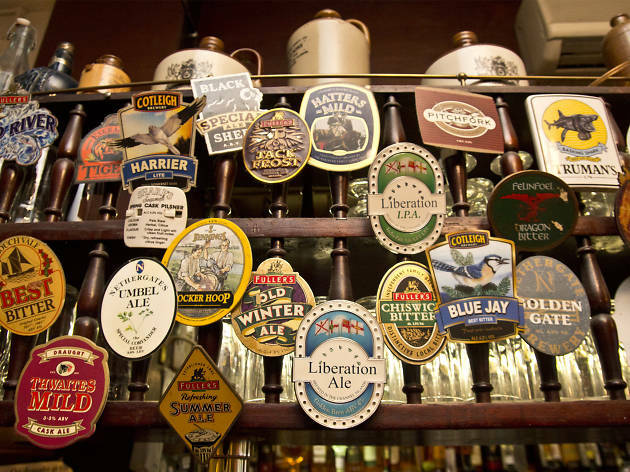 What to drink: Ale, ale and more ale. What’s the vibe? Buzzy and Hackney hip, yet appealing to all ages. When to visit: If you’re feeling playful, come by for a go at bar billiards. 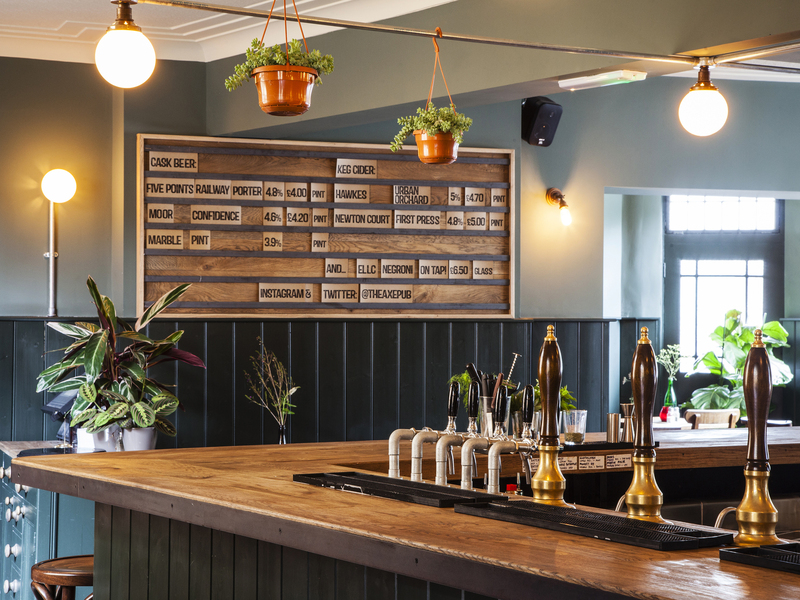 Five Points brewery now operate this boozer, so choose from their range on tap – the Railway Porter does a storming trade. What’s the vibe? Gastropub and microbrewery from the ETM group, with poshed-up interiors, wood paneling and an open fire. 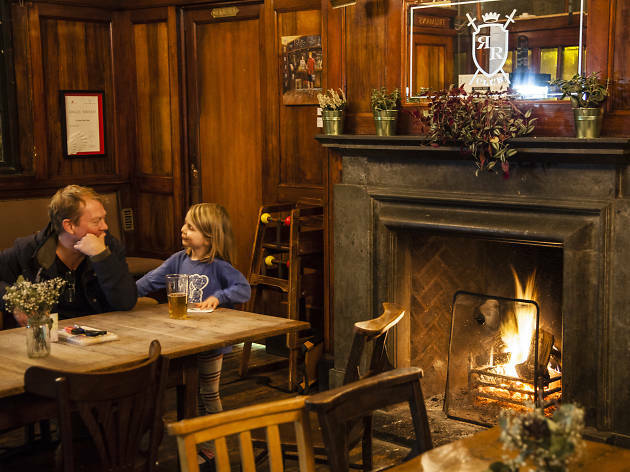 When to visit: Stop by for a roast and a dig through the Sunday papers in a mature pub setting, or come by to watch the rugger. What to drink: Try something on from Long Arm Brewery – like smoked stout Shadow Wolf – which is brewed on site so as fresh as it comes. What’s the vibe? 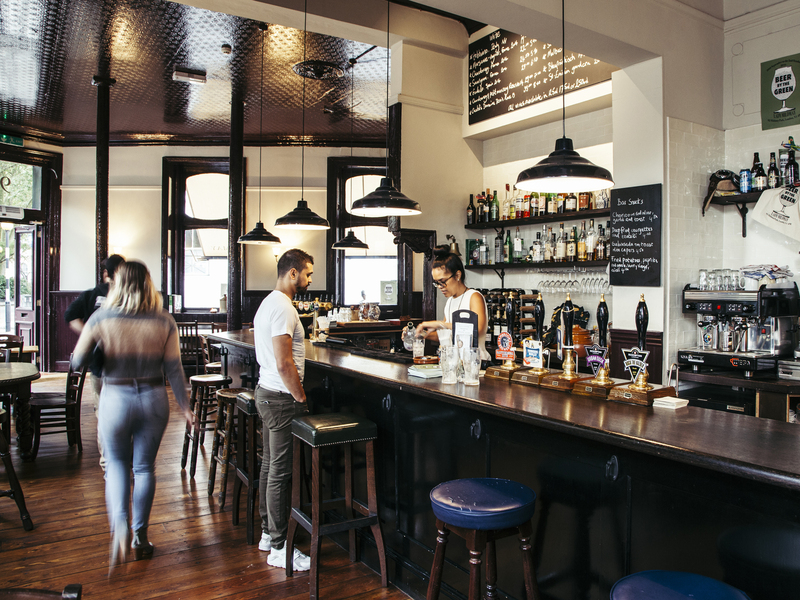 Comforting boozer for the north-east London set, the Lady welcomes its visitors with a spread of craft beer, pub grub and boardgames. Pooches are more than welcome too, and will love curling up by the roaring fire. When to visit: Get down early on a Sunday before the pub’s damn fine roast sells out. What to drink: Ask! 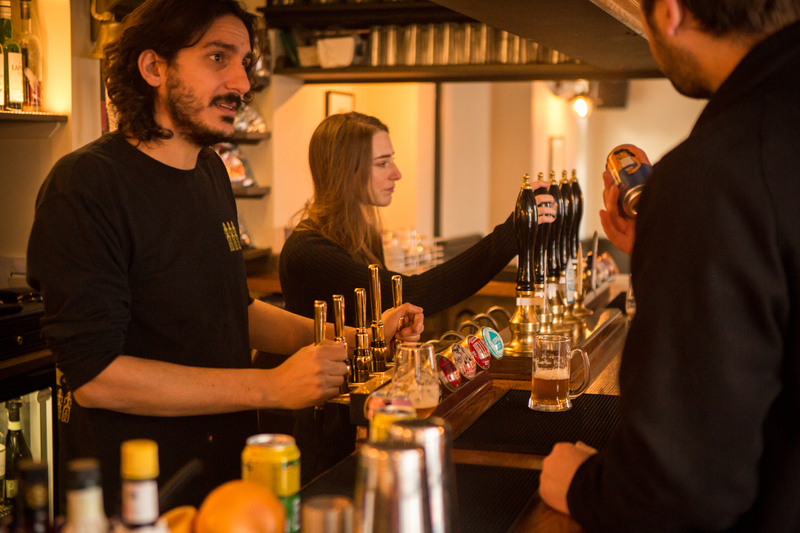 Staff happily guide you through the craft beers or the gin of the day. What’s the vibe? An old Hampstead boozer with a jazz club beneath, polished up with a smart look by new owners. 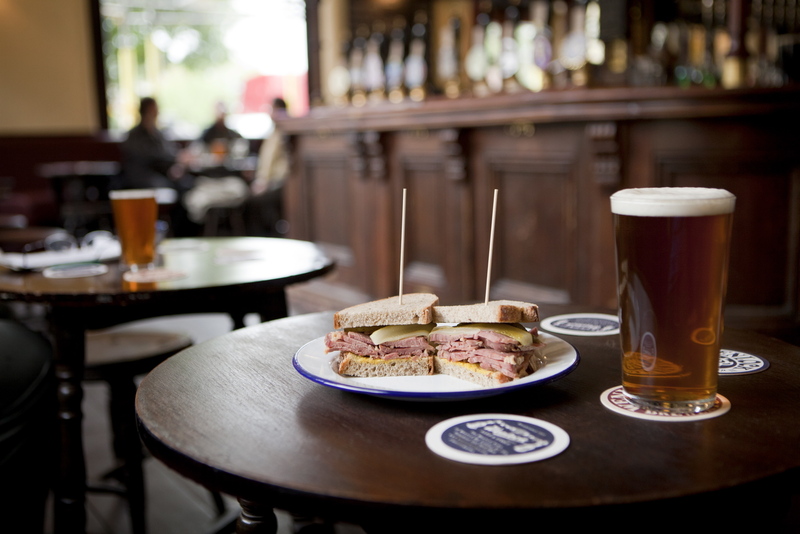 When to visit: Book a table for Sunday lunch – the pub is heaving, and rightly so. The wine list is a tempting read and a range of gins come with tonic pairing suggestions. Fancy stuff. What’s the vibe? Dim, beery and blokey – the sort of place you’d rest your feet after a day-long hike through the Lake District, only in Covent Garden. That’s what makes it one of the most perfectly English experiences you’ll get in the West End. 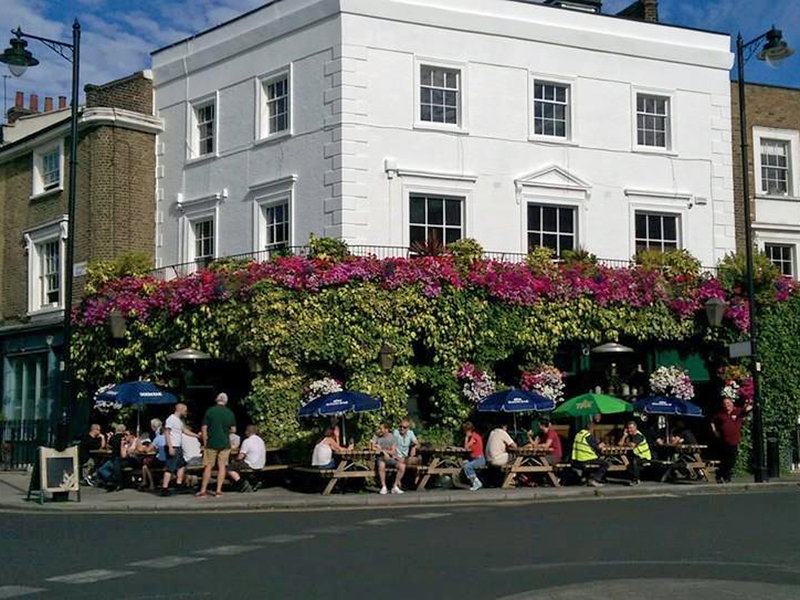 When to visit: When the sun’s out, so you can sup your suds amid the flowers and greenery that cover the entire front of the pub. What to drink: Anything from Brodie’s, an east London producer that almost pre-dates the London brewing boom. What’s the vibe? 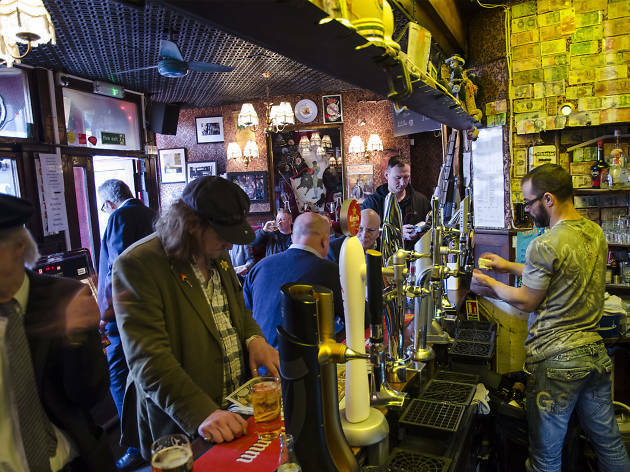 One long, lively room packed with beer-loving locals on an otherwise unloved section of Brixton Road. 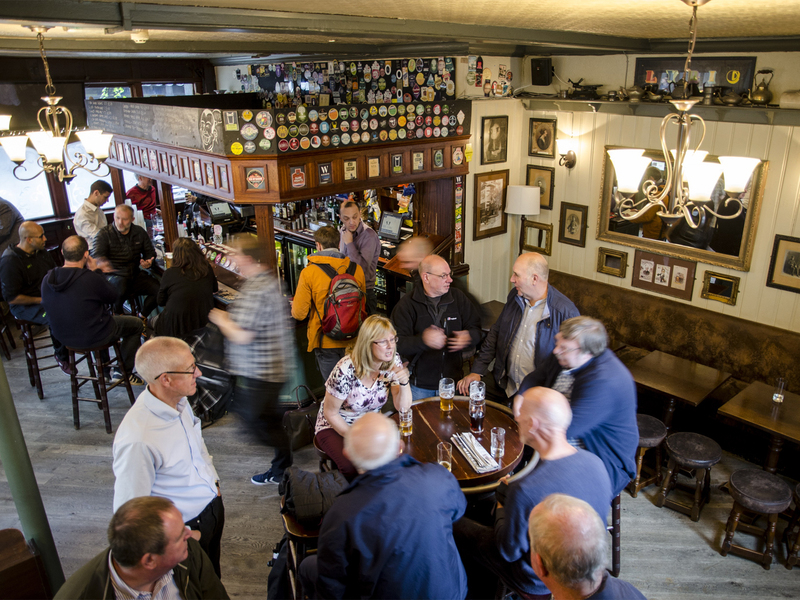 Seating isn’t designed for a settled down session – you’re encouraged to explore the bar instead for knowledgeable advice on beers and ciders sourced from all around the UK. When to visit: For a pre-gig party where the beer is always amazing. What to drink: The staff are always looking for the next brilliant British brewery, so try something new. What’s the vibe? Character over image; this is a dependable, no-nonsense spot for a proper pint. Look elsewhere for ironic lampshades and bare floorboards. When to visit: After an in-store gig at Rough Trade East, or to come back to earth after a spendy shopping trip in Spitalfields. 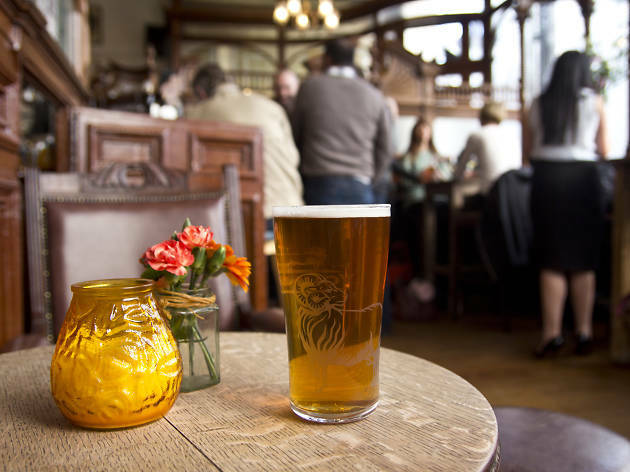 What to drink: The Crouch Vale Brewer’s Gold is a regular fixture, and a cosy couple of pints will make you feel like one, too. What’s the vibe? 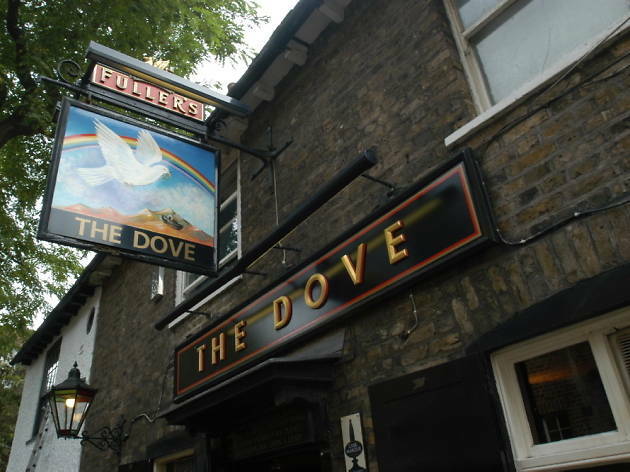 A classic duck-your-head heritage pub experience, The Dove also boasts a cracking riverside location. Plus, if you like a bit of history with your pint, famous past drinkers include Charles II, and ‘Rule Britannia’ was supposedly penned here. When to visit: When watching the boat race – just arrive very early. 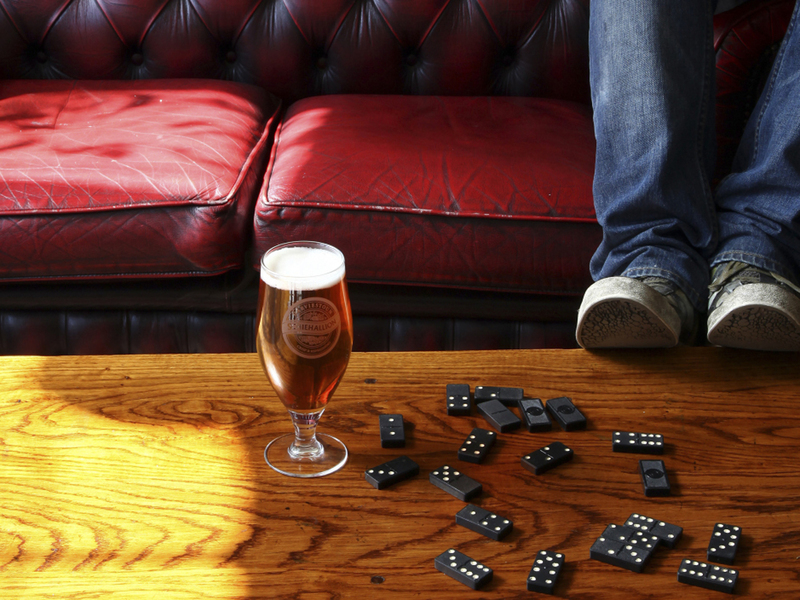 Fuller’s beers are made just up the road – it would be rude not to. What’s the vibe? 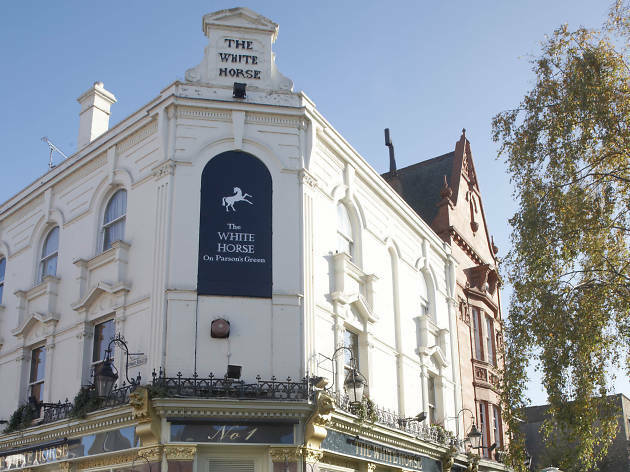 A former footie pub and a home away from home for West Brom fans, The Albion has been transformed into The Virgin Queen, a trad, wood-clad pub and chippy. When to visit: Make Friday a fry-day and come for a slap-up fish supper. Bring the dog in tow too – he’s sure to make some furry friends. What to drink: Discover something new through the pub’s ‘beers of intrigue’ scheme. Or look out for bargain bin ends on the wine list. What’s the vibe? 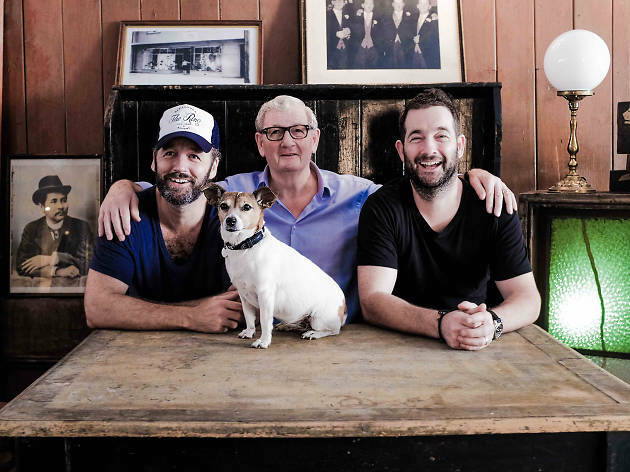 Unassuming backstreet boozer with a character all of its own – and a pub dog of its very own, too. The Hemingford is covered in plant life on the outside and decked in all kinds of props indoors, so there’s plenty to soak up beyond patter from locals. When to visit: On a sunny weekend afternoon, or for their Thursday-night quiz. 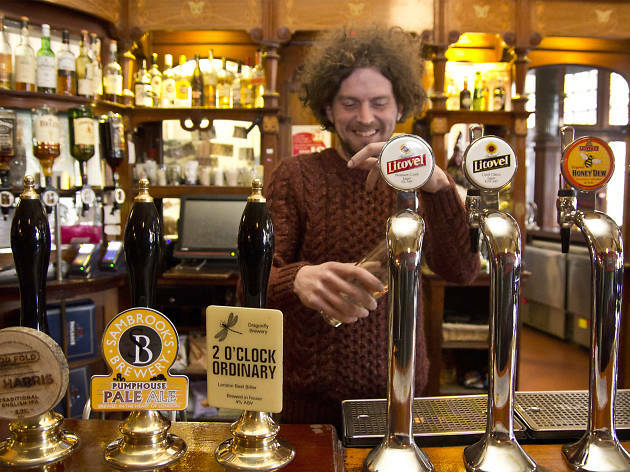 What to drink: Pick a pint of ale with the help of the well-informed staff. What’s the vibe? 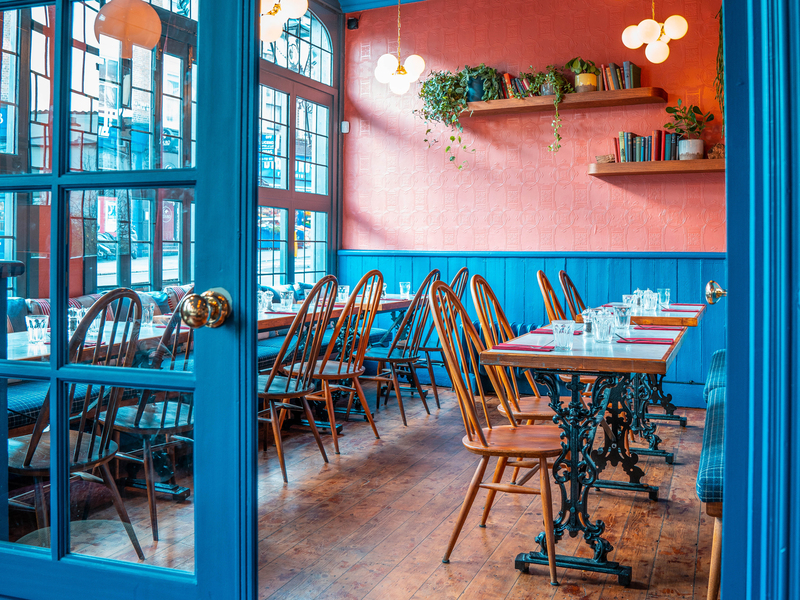 Perfectly treading the line between old-man boozer and cutesy retro watering hole, this Victorian corner pub is a lovely blend of the scruffy and the pretty. The old-fashioned island bar takes centre stage at the Royal Oak, and rightfully so. When to visit: To witness for yourself that there is still such a thing as the perfect pub. What to drink: One of the large range of Harvey’s ales: the Best really is. What’s the vibe? 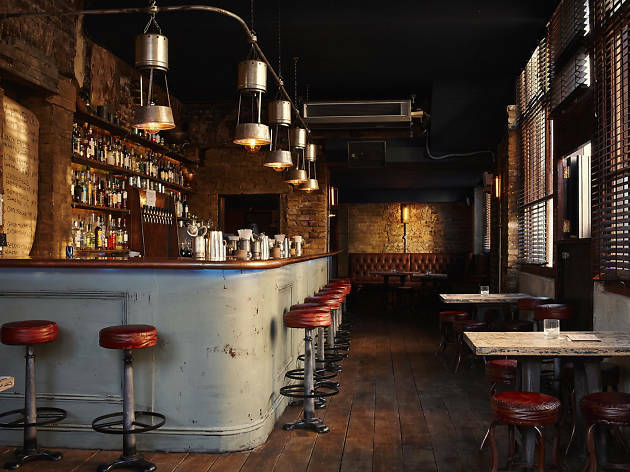 A dark pub in Bethnal Green with a penchant for poitín, a specialist Irish spirit. When to visit: Come to this brooding bar when you’re after a nightcap or an atmospheric drink after dark. What to drink: Alongside that poitín is a stonking collection of Irish-made whiskey. The cocktail list is pretty craic-ing, too. What’s the vibe? A relaxed and refined riparian inn littered with picnic benches out front and great for the summer months. 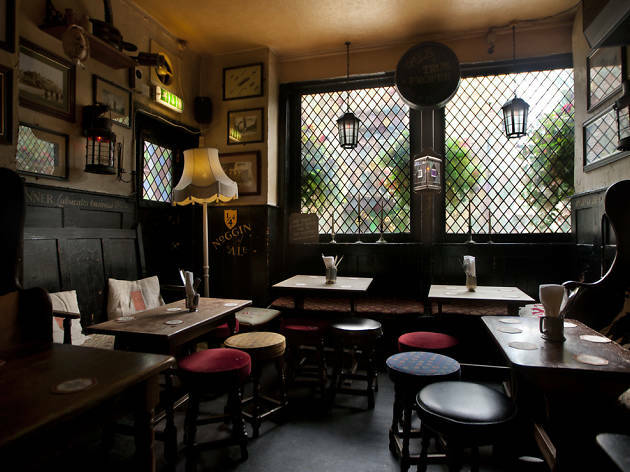 The Barge is just as beautiful and bright indoors and offers a roster of rugby fixtures on screen, but you didn’t come here for that, did you? When to visit: At the end of a riverside stroll. Your favourite waterside drink – it will taste even better here. What’s the vibe? 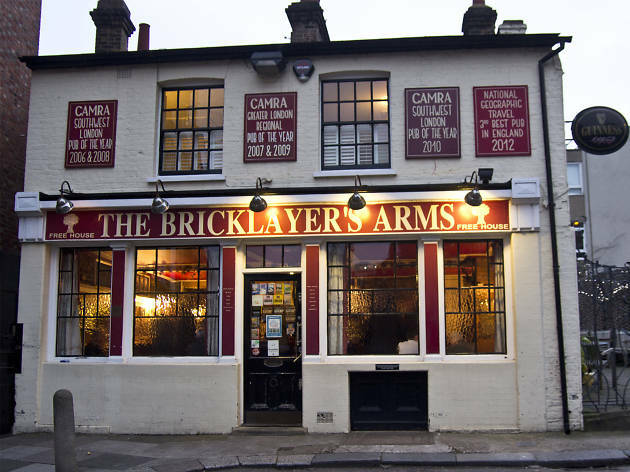 An extremely trusty and well-bred boozer with a strong line in beer. Chesterfield-style sofas in winter and an umbrella-covered outdoor area in summer make it ideal for families and groups of friends year-round. When to visit: When England are playing at Twickers (or when they’re not, depending on your stance towards funny-shaped balls). 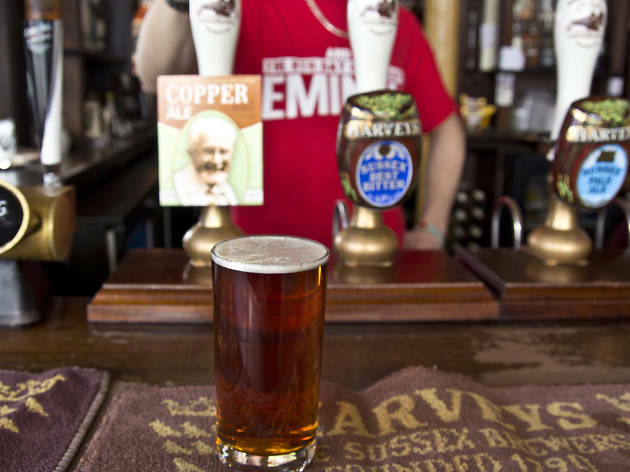 What to drink: A great British ale from a small brewery feels right. What’s the vibe? 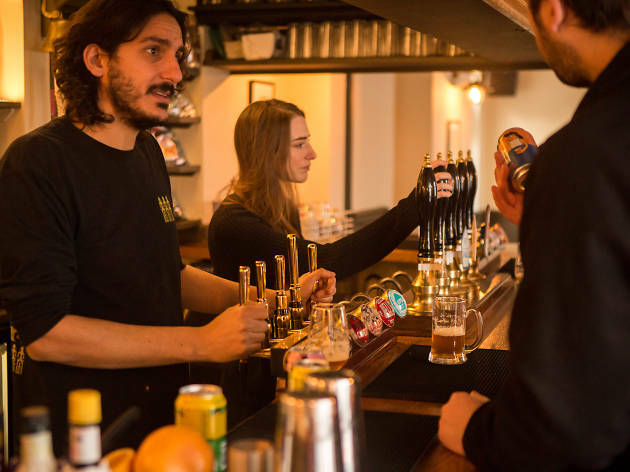 Cosy, welcoming beer bar with no frills or pretension. The focus is firmly on the booze at the Stormbird. It's no wonder nobody wants to leave at kicking-out time. When to visit: When chatting is just as important as drinking. What to drink: The third-pint tasters – that’s all you need of those eight-percent IPAs. What’s the vibe? A wonderful local that makes everyone feel at home. All aboard for London brews, Thai food and Golden Age rail ephemera on the walls. When to visit: The main Dalston drag is five minutes away – if that gets too much, stop in here. What to drink: The Yorkshire manager ensures there’s often a beer from God’s Own County on tap. What’s the vibe? Blue walls are pleasantly chipped, and wooden floors seductively scruffy at this Belsize Park boozer. When to visit: When you’re after an all-day session in one of the pub’s mega-cosy, near-horizontal armchairs. The Belrose brews its own pale ale, which is great for washing down specialty pizzas. What’s the vibe? A handsome Victorian inn turned hotel and gastropub. When to visit: Choose the light, bright ground floor for group catch-ups over grub. 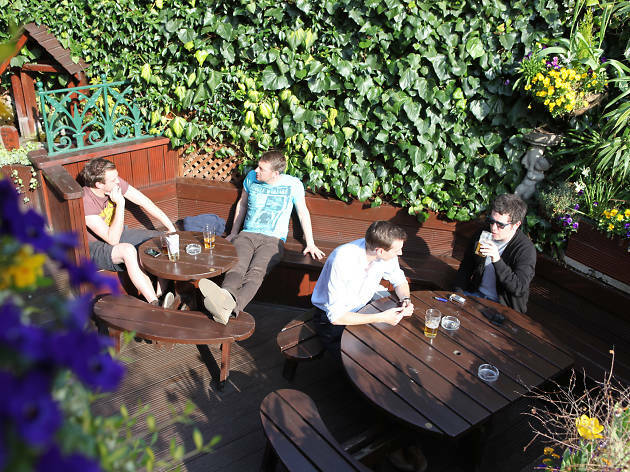 Or come in summer months to get blissed out in a diddy rooftop garden. What to drink: Organic wine, hoppy craft ales and cocktails with garnishes from that twee roof garden. What’s the vibe? An eighteenth-century time capsule by the riverside, The Prospect seems hardly to have changed since the days of dock workers and deckhands. Think low wooden beams and plenty of nooks and crannies. When to visit: On a hostile winter's night for the atmosphere, or in summer, when the large balcony and beer garden offer sumptuous views along the river. 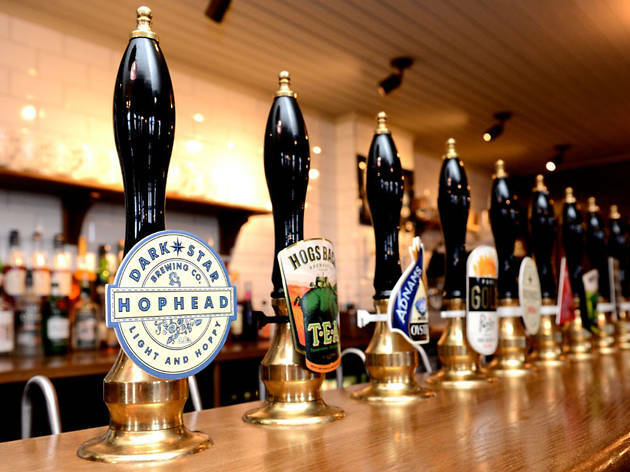 What to drink: The taps are fairly generic but you’ll find some interesting guest ales on the kegs. What’s the vibe? This Heathside local’s crafty reinvention has made it something quite special. The interior may be fairly generic but the location makes it an outright destination. Don’t believe us? Carry your pint out onto the bucolic Heath and enjoy. When to visit: A summery Sunday or a chilly winter evening. What to drink: Weird Beard's Decadence stout is a rich, comforting treat. What’s the vibe? Buzzy after-work pub with gorgeous original decor. Old Louise is truly, incredibly, spectacularly ornate: a warren of Victorian frosted-glass booths. See her to believe her. When to visit: Monopolise a booth with a few favoured colleagues, then convince each other you’re rolling deep in the VIP (the nineteenth-century VIP). What to drink: It’s all Sam Smith’s beer here – the oatmeal stout is the pick of the bunch. What’s the vibe? A handsome craft beer house that’s recently been shown some love by new owners Pubs of Distinction. Find an extravagant beer line-up and smart dining that suits the west London crowd. 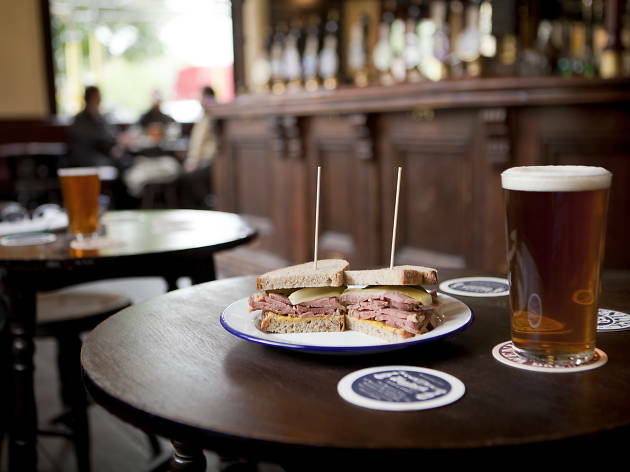 When to visit: The Cab’s menu is perfect when you’re after a beer and a bite – grab ‘beer snacks’ at two for £10. What to drink: A competitively priced pint of artisanal ale, with breweries from up and down the country being showcased at the bar. What’s the vibe? 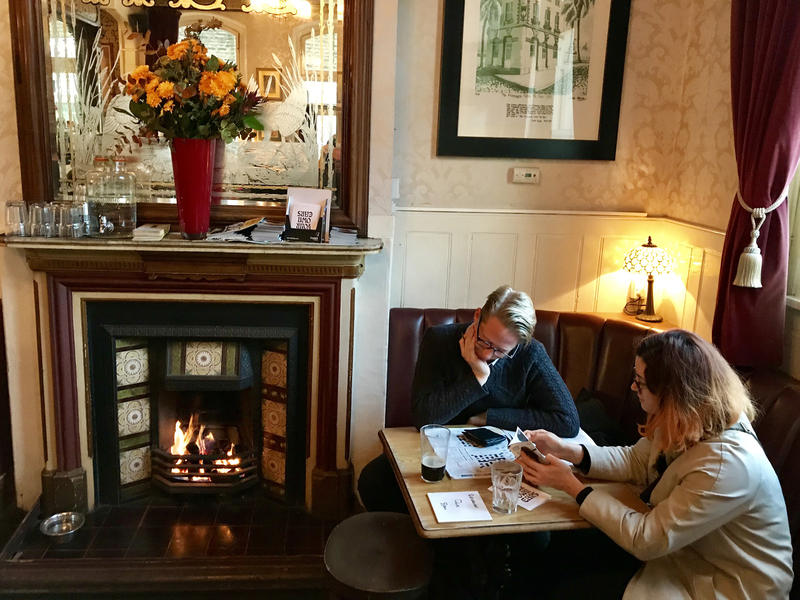 A comfortable pub with an excellent beer list from the esteemed Craft Beer Co – this is definitely their most cosy outpost. Dozens of taps means dozens of excuses to settle into this beer-heavy hideaway. When to visit: When you’re feeling decisive. What to drink: Ask a bartender for something new, gasp at their incredible beer knowledge, sip, enjoy, repeat. What’s the vibe? 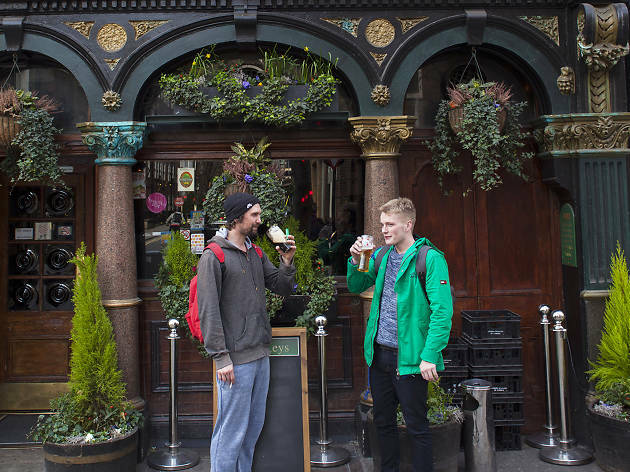 Everyone should pay at least one visit to this venerable Fleet Street landmark, where you’ll find curious drinkers seeking a taste of history in a warren of tiny old rooms. It’s seen some sights since the 1600s – you can just imagine Charles Dickens holed up in the corner by candlelight. ’s. You don’t have much choice here. What’s the vibe? 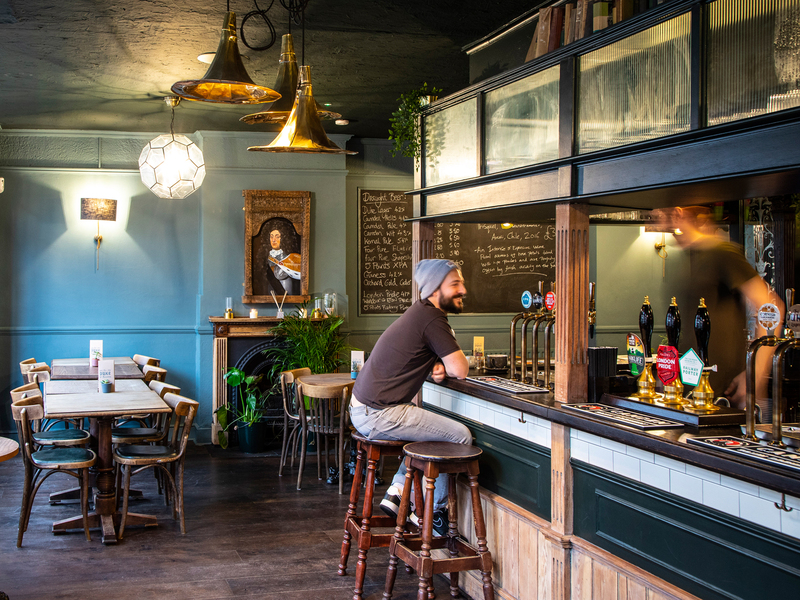 This pub perched on Lordship Lane may look bold on the outside, but indoors it’s chilled out and family-friendly, with just the right amount of buzz. Perfect Sunday roast territory, then. When to visit: Whenever local non-league side Dulwich Hamlet are playing – clusters of pink-and-blue scarved punters add lively (and crucially, not rowdy) atmosphere. What to drink: It’s mostly mass-produced suds on the keg lines, so look to the hand-pulled casks for options from local breweries like Brixton and Peckham’s Brick Brewery. What’s the vibe? A rare and endlessly fascinating old Victorian pub tucked away among the imposing mansions and canals around Warwick Avenue. The Prince Alfred has just undergone a bit of a spruce-up but it still retains its gorgeous carved woodwork and period snob screens. When to visit: To remind yourself that all pubs were like this, once. Of all the Young’s beers, the Double Chocolate Stout is probably the most interesting. What’s the vibe? 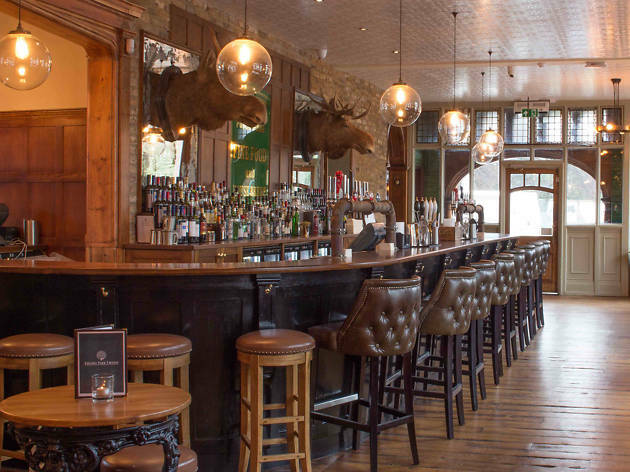 This Irish pub in Southwark has a modern twist from a popular Thai kitchen. When to visit: Any night of the week this place is abuzz. Get down early for a heavenly spot in a 10-seater snug with its own bar hatch. What to drink: It’s about more than Guinness. Try something on tap from County Cork craft brewery Eight Degrees. What’s the vibe? A Phileas Fogg themed pub (yeah, you heard) near Covent Garden. When to visit: Visit on Thursdays for a Cockney sing-a-long hosted by a character called Mr Carradine – a perfectly theatrical routine to find on the edge of theatreland. What to drink: Ales served in tankards and pewter cups, or a steaming mulled wine in the winter months. What’s the vibe? Charlie Chaplin’s old local, taken on by the Draft House chain, this Kennington boozer makes a fair few references to the ‘Little Tramp’. When to visit: In summer months when you’re feeling thirsty – there’s a roof terrace perfect for drinking in your short sleeve shirt. What to drink: Take your pick – but make it beer. Friendly staff help with a colossal selection, and the menu also helps pair your suds with cheesy snacks (the dream! ).